This is a cool freebie for anyone who likes to drink Knob Creek. 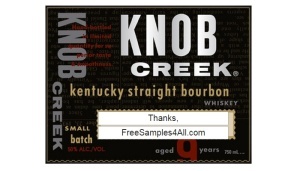 You can request these free Knob Creek labels with whatever custom message you want. They will send just the label to your house. This would make a great gift for someones birthday, anniversary or promotion. Knob Creek is a great bourbon that is considered a high end bourbon. This is a bourbon that can run up to $50 for a bottle. Now you can get it and have it personalized to you and give it an even higher end look. Show off to your friends or colleges with the very cool customized bottle labels.